How do you make your vision come alive? With intention. The vision is where you're going, and the intention is the direction and energy you use to get there. Your intention can be as big as your life or your business, or as small as a team meeting, an interaction with your child, or a project you're working on. We're always having an impact, and we always have the ability to set an intention for how we experience something or how we show up. The kind of impact you create always comes back to your intention. If you’re clear on your intention—and conscious of it—you’ll have more power to make your vision a reality. What if you don’t have any intention? If it's not a conscious intention, then the default unconscious intention wins. That's the "life is happening TO me" phenomenon...and your vision won’t come alive. In your business, when team members have different intentions or don't agree on how they are interacting with each other, you can spend a lot of energy on conflict and stress. Sit down with your team and figure it out together. What are your intentions going to be as a TEAM? 1. What outcomes do you want to create? 2. What emotional impact do you want to have on the people you're interacting with? 3. How do you need to show up to create that impact? 4. What do you need to believe to show up that way? 5. What do you need to do to make the impact happen? 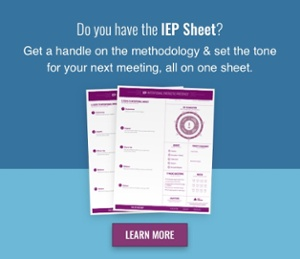 Master your next meeting with the free Virtual IEP Presence Guide. Download the free IEP Method QuickStart Guide.